“Expression is a powerful healing tool. 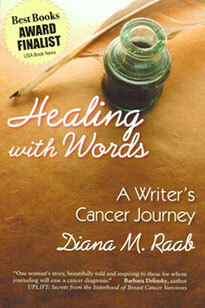 . . this book is a reflection of Diana M. Raab as she faced down two cancers and through her writing, found her power to keep her spirit up and keep up the fight. Through her own determination, she hopes to inspire others to rise up and embrace the same, and gives many important tips, such as the invaluable aspect of early detection. It is a poignant and powerful piece, very highly recommended.